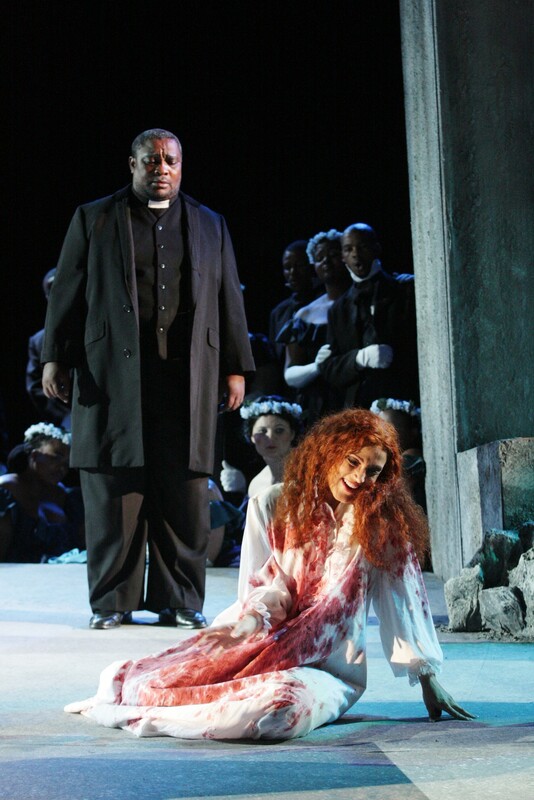 I just completed a very successful run in the title role of Lucia di Lammermoor with the Cape Town Opera. Thank you CCM for preparing me so well for the professional world! Reviews are posted below. Enjoy! Blood smeared with a dagger swaying already in hand and madness evident in her, the young soprano Bronwen Forbay (of Durban) enthralled the audience of the ArtsScape opera house on Saturday night. Donizetti’s opera is based on a story by Sir Walter Scott, based in Scotland. Enrico, head of the Ravenswood Castle, was in a financial trouble and forced his sister, Lucia, to marry a rich husband, Arturo. Lucia is in love with Edgardo, but has no choice but to marry Arturo. On their wedding night, however, she becomes insane and kills Arturo before her beloved Edgardo sees her again. The role of Lucia in this opera is one of the greats for a coloratura soprano, who sings high notes, fast, light runs, and lyric phrases. Forbay’s voice has all these qualities, and especially her high notes are perfectly placed and cured. Forbay’s intonation was pure and the sound is easily produced. Lucia is destined to be one of her signature roles. As the aggrieved Edgardo, the local tenor Given Nkosi impressed. Nkosi’s voice beamed, and his performance was dramatically strong. He and Forbay’s duet in the first act was nothing less than exciting. As the evil Enrico, the Italian Paolo Ruggiero provided a strong interpretation. His voice demonstrates a well-established vocal technique, and his performance was, on the whole, convincing. Enrico could have been even more terrifying and evil. The famous and beloved sextet – Nkosi, Forbay and Ruggiero with Monika Voysey (Alisa), Mthunzi Mbombela (Arturo) and Xolela Sixaba (Raimondo) – is powerful and impressive. Voysey and Sixaba’s singing in the rest of the opera must be singled out. This is a repeat of 1997 Angelo Gobbato’s presentation and his direction is still good, although the set had a static feel. Scenery is largely brought about with Faheem Bardien’s most excellent lighting, but in some scenes the lighting is just too extravagant. This performance is definitely worth seeing and experiencing. It’s a no-frills production, sung well overall. The opening night of Cape Town Opera’s (CTO) Lucia di Lammermoor was dedicated to the memory of the late Joan Sutherland, who died this week and who made the role of Lucia so much her own. The South African coloratura soprano, Bronwen Forbay, sang the title role. She was greeted with rapturous applause after the infamous mad scene. The applause was thoroughly deserved: she managed the floral vocal lines with aplomb and fused these beautifully with Lucia’s deranged state of mind. Given Nkosi (tenor) sang her lover Edgardo. He also earned appreciation from the audience and sang with commitment. Apart from Forbay, he was the most committed dramatically to his character. Enrico was sung by the Italian baritone Paolo Ruggiero. He has a gloriously strong voice that is fully developed in all its registers. Unfortunately, he is not an actor. As examples, the first meeting between him and Edgardo, as well as their final encounter, were amateurish and unconvincing. The chaplain was pleasingly sung by baritone Xolela Sixaba, who also took well to his character. Arturo was sung by tenor Mthunzi Mbombela and Alisa by soprano Monika Voysey. Both these singers are competently developing as professionals. Mbombela had one or two unstable lines, and Voysey should have been made up to portray a much older woman. The vocal highlights were the sextet and Lucia’s final mad arias. The former was a glorious exercise in vocal ensemble as well as careful balance with the orchestra. And Lucia’s solo vocal fireworks were exquisitely executed, not just in accuracy, but also with musical sensitivity. The orchestra under Kamal Khan played very well. They were supportive at the tender moments and dramatic where it counts. Strings were well intoned and harpist Jane Theron and flautist Gabriele von Durckheim had beautiful solo passages. The Voice of the Nation Chorus was well trained by Albert Horne and Elisabeth Frandsen. The initial male chorus battled a bit with following Khan’s time, but otherwise gave a satisfying performance. If it’s great singing you want, you won’t be disappointed with this production of Lucia. Décor and acting, however, were rather anaemic. Peter Cazalet’s monolithic set and bland costuming needed a bold dash of colour somewhere: a blue fountain, a green tree, a red moon, a yellow bouquet at the wedding? Published on the web by Tonight on October 20, 2010.